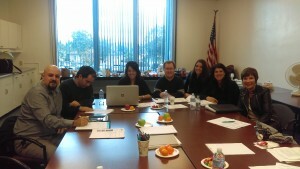 California Consulting Hosts End of Year Management Team Meeting in Montebello CA - California Consulting, INC.
On January 5, 2015 the California Consulting management team met in Montebello to recap 2015 and discuss company goals for 2016. Our primary goal is to continue to strive to provide the excellent grant writing service that has made California Consulting the state’s largest and most effective grant writing company. We are grateful for the confidence that many public agencies, non-profits, and others ‎have placed in us. California Consulting had an outstanding day long management team meeting bringing together our Northern California, Central California, and Southern California team leaders under one roof. Looking forward to great things in 2016!